A recent federal court ruling could open a new wave of redistricting challenges across the country. And that includes Oklahoma, where Republicans now control 78.5 percent of the statehouse seats – a 10 percentage-point increase since the GOP-controlled Legislature redrew legislative boundaries five years ago. In a possible watershed case decided in November, a three-judge panel struck down the Wisconsin state assembly’s redistricting map by saying it unlawfully favored Republicans. The case is notable because it’s only the second time in the nation’s history, and the first time in decades, that a redistricting map was thrown out on partisan grounds. It is also significant because two judges wrote they were partly influenced by the plaintiff’s use of a relatively new mathematical measure, called the “efficiency gap,” that is intended to detect evidence of partisan gerrymandering in any state. Gerrymandering involves the drawing of political boundaries, which occurs every 10 years after the U.S. census, with an intent to favor one party. In a calculation of efficiency gaps, Oklahoma and 11 and other states scored above what some legal experts and academics argue should be the legal threshold for evidence of gerrymandering. The U.S. Supreme Court is now expected to consider the Wisconsin case because defendants have challenged the ruling and the nation’s high court is required to hear all redistricting appeals. If it were to accept the efficiency gap as an indicator of possible unconstitutional gerrymandering, it could have ramifications nationwide. A high efficiency-gap score doesn’t automatically prove that a redistricting plan unconstitutionally favors one party over another. States could still demonstrate that their plan reflects legitimate districting goals or natural political geography. But acceptance of the formula would place a greater burden on states to defend their plans or risk having them thrown out. Republicans hold 78.5 percent of Oklahoma legislative seats, including 42 of 48 Senate seats, for 87.5 percent, and 75 of 101 House seats, for 72.3 percent. Click on a district to see its senator or representative. The efficiency gap was developed several years ago by Eric McGhee, a research fellow at the Public Policy Institute of California, and Nicholas Stephanopoulos, an assistant professor of law at the University of Chicago. In an interview, McGhee said the intent was to provide a uniform measure of gerrymandering regardless of state or the size of a party’s control. –Cracking, which is spreading ideologically like-minded voters across multiple districts so they can’t achieve a majority in any one. –Packing, which is concentrating many ideologically like-minded voters in a single district in order to concede that district and win surrounding ones. Since the formula was unveiled in a 2014 law journal, it has been used by plaintiffs in several redistricting challenges. McGhee said that unlike other formulas used previously to identify possible gerrymandering, this is particularly useful in states like Oklahoma that have a party with significant control. 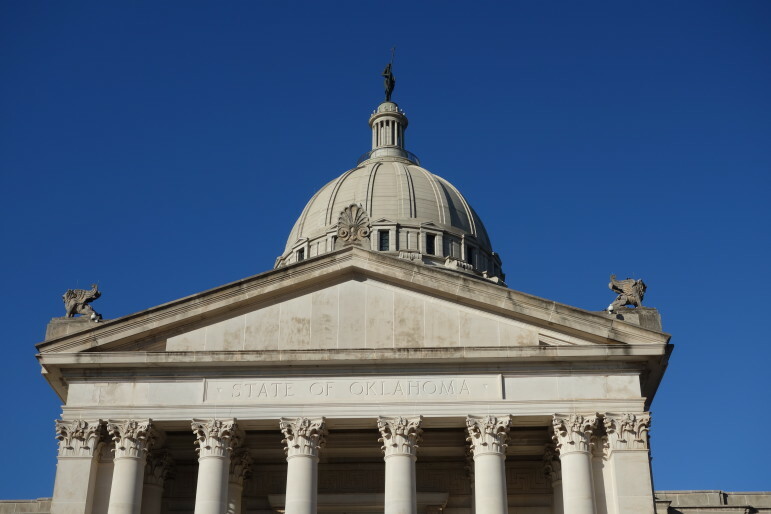 In the 2012 state House election, the first election after the last redistricting, Oklahoma would have failed McGhee’s and Stephanopoulos’ efficiency-gap test, the researchers found. They proposed that a statehouse redistricting plan is “presumptively unconstitutional” if it has an efficiency-gap score of more than 8 percent. That means one party would be able to win at least 8 percent more seats than if both parties had wasted an equal number of votes. Using additional data modeling, the two also tested whether a plan would likely stay unbalanced for the rest of the redistricting cycle – the decade. With an efficiency gap of nearly 9 percent favoring Republicans, Oklahoma met both of those criteria. Others states that failed the test were Idaho, Indiana, Kansas, Michigan, Missouri, North Carolina, Ohio, Rhode Island, Tennessee, Wisconsin and Wyoming, according to the political scientists’ work. Oklahoma Watch calculated the efficiency gap for the two most recent state legislative elections and found the gap exceeded the threshold in favor of Republicans both years. In the House: 12 percent in 2014 and 10.5 percent in 2016. In the Senate: 10.5 percent in 2014 and 14.4 percent in 2016. By comparison, McGhee’s and Stephanopoulos’ work showed that Oklahoma’s redistricting plans of the 2000s produced a range of efficiency-gap scores that favored both Republicans and Democrats, depending on the year. Democrats enjoyed efficiency-gap scores largely in their favor during the 1990s, 1980s and 1970s – although not to the extent that Republicans are favored under current plans. That’s not to say Oklahoma’s plans are necessarily unlawful or that any illegal gerrymandering occurred. Even supporters of the efficiency-gap method say more evidence would be needed to prove a case of gerrymandering. In Wisconsin, the plaintiffs subpoenaed memos and other documents that they argued demonstrated clear intent to draw the maps to favor Republicans. U.S. District Judge William Griesbach, who cast the sole dissenting vote in the Wisconsin case, is among the critics who argue the efficiency gap is a substandard measure. Griesbach also wrote that high efficiency-gap scores can be a byproduct of a state’s political geography, especially in states where Democratic-leaning voters are typically located in tight urban areas that have more potential for cracking and packing. But in the Wisconsin case, those who challenged the maps argued that Republicans went out of their way to ensure their party could gain seats even when Democrats fared better statewide. As an example, they pointed to the consulting work of University of Oklahoma political science professor Keith Gaddie, whom Wisconsin Republican leaders hired; they used his work to help craft their plan. Gaddie was paid $300 an hour and signed a non-disclosure agreement as part of his contract, court records show. Gaddie’s work included data modeling that predicted how Republicans and Democrats could expect to fare under different versions of the proposed maps. Lawyers for the group of citizens challenging the redistricting plan said this and other evidence showed the plan was enacted with “discriminatory intent” and disproved the GOP leaders’ testimony that partisan makeup played “no part at all in their decision.” The panel of judges agreed. Oklahoma’s latest redistricting map also faced allegations that it favored Republicans. Former Sen. Jim Wilson, D-Wilson, sued Gov. Mary Fallin and legislative leaders shortly after the 2011 Senate Redistricting Act was passed and signed into law. He argued the GOP-controlled Senate intentionally drew boundaries to benefit the Republican Party. Karl Ahlgren, who co-founded Republican consulting firm AH Strategies and worked there at the time, was paid $127,500 to help write the 2011 plan. The state Supreme Court rejected Wilson’s lawsuit, saying he didn’t provide “discernible and manageable standards” to prove political gerrymandering had occurred. Wilson said recently he still believes it was a “rigged” process that shaped several Senate districts to improve Republicans’ chances in future years. However, few people raised accusations of widespread gerrymandering at the time, and any outrage paled in comparison to that in other states, such as Wisconsin. Seven of the 16 Democrats in the Senate, including Sen. Sean Burrage, D-Claremore, vice-chair of the redistricting committee, voted for the plan. The House redistricting plan was even less contentious. It passed 93-3 in the House and 43-4 in the Senate, with most Democrats in both chambers backing the bill. The GOP’s gains in the Legislature could be viewed as a natural political shift in the state. The number of Republicans in the House and Senate has increased from 102, or 68.5% of members, to 117, or 78.5%, in the three elections since new district boundaries took effect. During the same period, the proportion of registered voters who are Republicans increased from 40.6 percent to 45.6 percent. If the trend continues or the GOP holds its lead, the party will be poised to have even greater sway over the drawing of new boundaries in 2021 – boundaries that could affect political fortunes for a decade. Li, of the Brennan Center for Justice, said regardless of what party is in power in any state, it’s important that there be checks and balances on the redistricting process. This story has been updated with comments from OU political science professor Keith Gaddie.